Great Show! Here's How to Catch Up! This show is worth watching and you can probably just start where CR does, but if you want to catch up but don't wanna watch all 700+ episodes here's a couple of options to catch up quickly. *Note: I would suggest at least watching all of season 1 (28 or so episodes) for all options. 1. Feel free to choose what icons you decide to watch but know that the most important are the Black Organiztion and FBI icons, along with the first 5 or so episodes. 2. If you are coming here from Magic Kaito 1412 then you may want to watch the episodes with the Kaito Kid icon. You also may want to check out the original Magic Kaito series as well. WE NEED MORE CONAN BY GOLLY! holy bajeezes ill pay an extra dollar a month, no no! two dollars if you give us all the episode before this too. oh ya by golly and my first born child, you betcha. this shows got it all if your in to detective shows. its a mystery wrapped in a question and dunked in WHAT THE F^@K sauce rolled up in a HOLY S31T sheet of awesomeness, I'll tell you what! Detective Conan is one of the longest anime series of all time, and for good cause. It has such a complex story that people don't know about and so much to enjoy past the surface. The characters are all cool and likeable (except the Shonen Tantei) and even the non-plot related stuff, which is most of it, keeps you on your seat. If you love mystery, good characters and thrilling stories, this is your series. This thing needs more recognition from English audiences so companies like Crunchyroll can actually give it the treatment it deserves. I can just say that as a Conan fan since 2004, I'm beyond elated to be able to watch it in it's best quality while being able to support it financially. I would buy a Crunchyroll subscription just for this show. 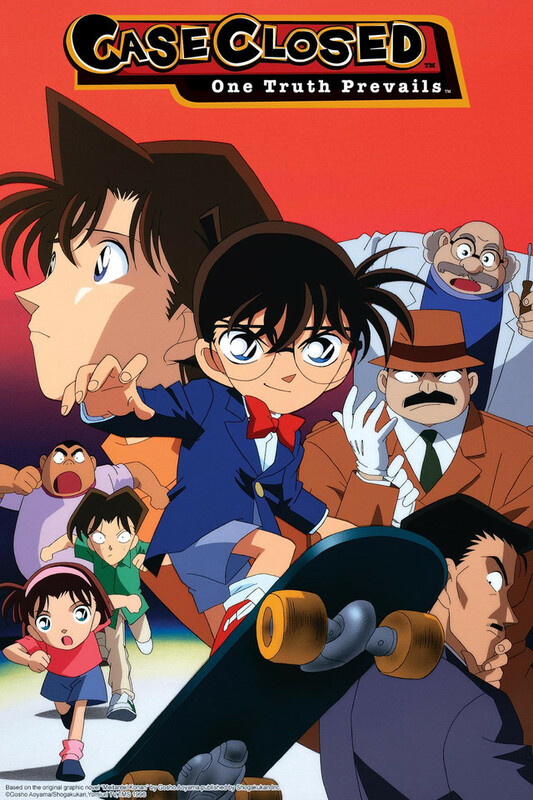 Case Closed (Detective Conan in Japan) is a classic anime series that has been around for over 20 years now. At its core, Case Closed is a murder mystery of the week show. Meaning its plot is more episodic without a lot of meta or seasonal plots. There is an overarching plot to the show involving the "Men in Black" that pops up on occasion but in general you will enjoy the show to it's fullest even if you haven't seen earlier episodes. Unlike most episodic plot type shows, Case Closed doesn't suffer from overly superficial characters but has a rich and engaging cast that you will quickly fall in love with. The other great strength of the show is the mysteries particularly the puzzles surrounding them. A number of the puzzles will be codes and other wordplay. It's really interesting to see how codes and wordplay work in a different language particularly with the use of Kanji (Japanese writing system). They also will commonly use English and Japanese together in the puzzles and codes. This may sound intimidating, if you don't know a bit about Japanese writing but I have found the subtitles explain the core of what's going on well enough without the need of any prior knowledge. It's not all wordplay but I find those particular puzzles the most fun. The set up of the show is a bit complicated so if you do not know anything about the show you might be slightly confused. Here is the basic set up. The central character is a high schooler named Shinichi Kudo. He is a genius who is the son of a mystery novel writer who lives in America. Shinichi has an obsession with Sherlock Holmes and wants to become a real-life Holmes himself. He crafted his deduction skills and quickly became known as a detective genius. Even in High School, he was routinely asked to consult for the police on tough cases. This success got to his head and one day, while on a date with his high school friend Ran, he saw some nefarious folks up to no good at the amusement park. He decided to investigate by himself, got caught, and the "Men in Black" forced him to take a drug. This drug was intended to kill Shinichi but instead it shrunk his body back to a small child. He now goes by the identity of Conan Edogawa and is in hiding living with Ran and her dad, a deadbeat private detective. Most people do not know that Conan Edogawa is Shinichi Kudo in hiding. The only people that know is Dr. Agasa, Shinichi's neighbor; Ai Haibara, a girl living with Dr Agasa (there's a lot more to her character but I won't get into it here); and Heiji Hattori, another genius detective and shinichi's rival and friend who lives in Osaka. Ran, Ran's Dad, most of the police force, and other characters do not know his true identify. With all that said. Most of that really isn't super important. At the core, the show is about Conan solving mysteries each week. But the double identity thing does come up and I could see it being a bit confusing so I explained it here. You can also learn more about the characters and meta plot online on various wikis if you get into the show. But again, Don't think "oh they don't have the first 753 epsiodes so I can't start watching this." Or "my god 754 epsiodes I don't have the patience to watch all that to catch up." It's really not important. I have not seen every episode of this show either but I have come to love the show and I don't have a huge issue with not having seen everything. Watching in order is not super crucial and watching everything is not super crucial. Watch when you can and enjoy the show. Please give this show a try. I feel it is really worth checking out. two of many awesome moments. why? why did u save me? a logical mind isn't needed, right? you're a troblesome and tough case, you know! even if i were holmes, it'd still be impossible to figure out! how can one accurately deduce that! Along with one truth, waiting also prevails. All I can say is wow the show is a lot better than I remembered it! When I was younger I would get up at about 5am to watch Case Closed on Cartoon Network, so when FUNimation pulled the plug on the dub I was kinda sad, but I knew that one day the show would get another chance in english one day or another and here it is, granted I would have preferred it dub but thats just my nostalgia talking. This show is just pure awesomeness. I am a huge fan of games such as Ace Attorney and I love crime shows like Law and Order and honestly this anime was always right up my alley. So if you are a person who are into crime shows, games like Ace Attorney or just want to see a good mystery seriously just give it a watch. I hope this series will continue to be an uber success on here! And who knows maybe one day we can see the earlier episodes subbed, or even dubbed, either or works right now I am just glad to be able to watch this again in a legal way!